Sensory Integration for Autistic Children: What is the Proprioception System? Sensory integration is the organization of sensory information so that the child can use it to learn and interact with their environment. One of the sensory systems that is critical to brain organization is called the “proprioceptive” system. The word “proproprioception” comes from the Latin word “proprio” which means “ones’ own”. It tells a child where his own body is in relation to other people and objects and helps him to move through space. The brain uses proprioceptive (along with vestibular and tactile) information to plan and execute coordinated movements. Individuals with autism often have poor proprioceptive awareness impacting body awareness and coordination. Perhaps it is easier to understand the importance of proprioception when taking a look at what happens when a child with Dysfunction in Sensory Integration (DSI) is not getting the necessary feedback from sensory receptors in the muscles, joints, ligaments, tendons and connective tissue. A baby might struggle to mold comfortably into a mother’s arms. A toddler may not be able to coordinate walking unless looking at her feet and a pre-school aged child might end up squeezing in between two children sitting on the floor because she doesn’t realize that the space isn’t large enough to fit her body. A five year old child might pour a carton of milk too quickly because she misjudged how heavy it was and squeeze an egg so hard that it breaks in her hand before putting it into the bowl. Proprioception enables children to play “Pin the Tail on the Donkey” because they have the body sense to know where they are in relation to the donkey picture and where the tail is in relation to the rest of the donkey. The child who pins the tail (while blindfolded) in the right spot demonstrates good body and spatial awareness. This will help him to also fit shapes into sorters and form letters to fit inside lines. ·Molding clay or play dough. ·Ripping paper to make paper mache or other art projects. ·Squeeze toys that make sounds or squirt water. ·Pulling objects off Velcro backings. ·Using construction toys that snap or push together. ·Pushing crates, chairs, carts or other heavy, large objects. Older children with autism and adults may benefit from the heavy work activities of lifting weights, jogging, wrestling or martial arts. The combination of vestibular and tactile activities with proprioceptive input promotes sensory integration. 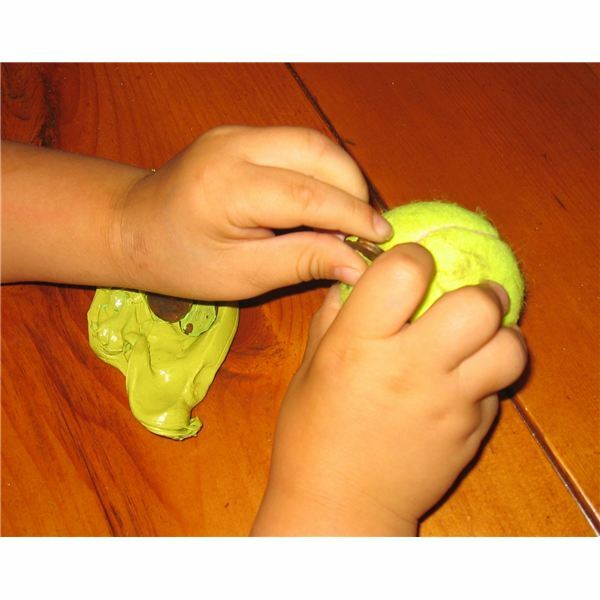 Removing pennies from putty and then squeezing a tennis ball while pushing the pennies inside an opening provides a great deal of proprioceptive stimulation. This activity also strengthens hands and promotes motor planning skills. I drew a face on the ball and call him "Hungry Harry".